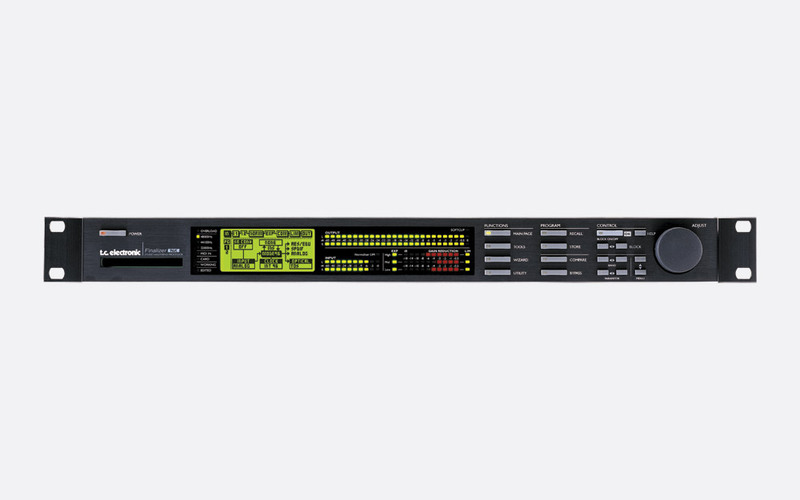 These rack processors are equally at home in recording studios as they are in TV or radio broadcast studios or theatres and arenas. The selection includes a mastering processor, a multifunctional reverb, delay, pitch, dynamics and EQ processor and reverberation processors. TC Electronic has a reputation for designing and manufacturing signal processing equipment of the upmost quality for the broadcast, live sound reinforcement and post production audio markets. This is a dual-engine effects processor, designed for use in studios and in live environments. A host of user configurable reverberation, delay, chorus, flange, gate, and compressor presets enable the operator to tailor to their own needs before storing as a new preset in one of the hundred user preset spaces. 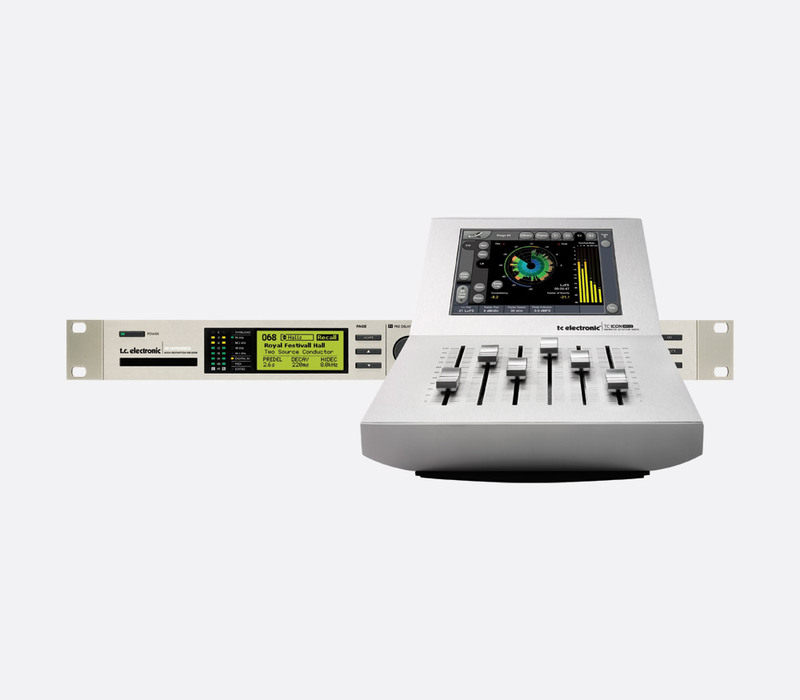 A 23-character, 280-icon STN-LCD display shows useful information including input audio signal, patch name, routing, effect balance, and effect engine used. Three rotary controls to the left of the display allow the operator to quickly set input level, mix percentage level and effect balance between engines 1 and 2. Various push buttons give access to setup menus, effects edit and bypass, program recall and store, and navigation, with a large rotary control for scrolling through menu options and values. Including the 'Dynamic-Delay' function that was introduced on the popular TC 2290 studio delay, the D-Two is capable of tap rhythm patterns of up to ten taps and up to ten seconds of delay. Designed for both studio and live use, the D-Two comes loaded with 50 factory presets and space to store 100 user presets for recall. In addition to the traditional feedback delay, both 'Straight' mode - which includes the ability to control the exact number of repeats; and 'Rhythm' mode - which allows the user to tap out a specific rhythm for repeating, are included. A multi-coloured 23-character, 280-icon STN-LCD display shows important information including input levels, preset name, feedback filter, delay time, and dynamics. Two rotary controls on the front panel control input level and mix output. Buttons for 'tap' and feedback are used in conjunction with a large rotary control to adjust repeat and delay attributes. Other push buttons on the front panel allow the user to edit or switch on/off spatial, filter, chorus, reverse, ping-pong and dynamic effects. Eight additional push buttons and rotary control allow for quick recall, setup, store, bypass and navigation. Analogue inputs: 2x 6.35mm jack, 21k ohms, balanced, 13k ohms unbalanced. Analogue outputs: 2x balanced 6.3mm jack, 40 ohms. Digital inputs and outputs: RCA phono, S/PDIF. Sample rates: 44.1kHz, 48kHz. Pedal connection: 6.35mm jack. MIDI: In, out, thru. Power source: 100-240V AC, 50-60Hz. Consumption: less than 15W. Dimensions (WxHxD): 483 x 44 x 195mm. Weight: 1.85kg. M2000 dual-engine effects processor gives the operator the use of two independent and simultaneous effects. The unit includes four preset banks including two factory preset ROM banks and two user preset RAM banks, all with 128 slots. The first bank of factory pre-loaded presets includes reverb, delay, pitch, dynamics and EQ whilst the second bank includes 128 combination presets which when recalled automatically set the effect and routing options for both engines. 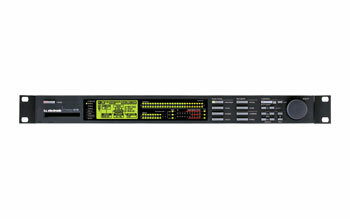 Various buttons on the front panel of the 1U rack mount effects processor give quick access to I/O, routing and MIDI utility set-up, along with cursors to navigate the 56 x 128 dot graphic LCD display menus. Separate control over effects engines 1, 2 and combined 1+2 give quick access to the Recall Wizard function which can be used to quickly find the preset that best suits the user's intent after inputting the preferred algorithm type, instrument, and effect level into the multiple choice boxes. Analogue inputs: 2x Balanced 3-pin XLR, 20k ohms. Analogue outputs: 2x Balanced 3-pin XLR, 100 ohms. Digital inputs and outputs: 3-pin XLR, AES/EBU; RCA phono, S/PDIF. Sample rates: 44.1kHz, 48kHz. MIDI: In, out, thru. Dimensions (WxHxD): 483 x 44 x 208mm. Weight: 2.35kg. This is a dual-engine reverb unit designed for professional music and film productions. 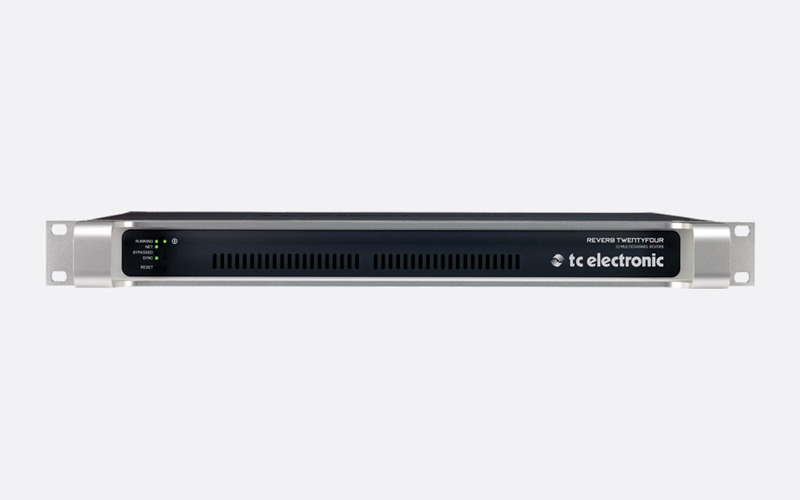 Utilising the TC Electronic VSS technology, the M3000 can give a modulation free reverb with a 'wide and natural' sound, simulating the responsiveness of an actual room. With 500 single factory presets and 100 combination factory presets this reverb processor contains high quality reverb algorithms including TC Electronic designed VSS-3, VSS-Gate, VSS-FP, VSS-SR, C.O.R.E. and Rev 3. It also houses many other popular processing effects including delay, chorus, tremolo, de-esser, and compression. The user can store up to 250 single user presets and 50 combined user presets in the available internal RAM slots, or the same number of user presets on an inserted PCMCIA card of 2MB. The M3000 shares the front panel layout of the M2000, including the 7-stage PPM indicators, and overload, sample rate, MIDI in and tempo indicators. Analogue inputs: 2x balanced 3-pin XLR, 20k ohms. Analogue outputs: 2x balanced 3-pin XLR, 100 ohms. Digital inputs and outputs: 3-pin XLR, AES/EBU; RCA phono, S/PDIF; Optical, Tos-link/ADAT. Sample rates: 44.1kHz, 48kHz. MIDI: In, out, thru. Dimensions (WxHxD): 483 x 44 x 208mm. Weight: 2.35kg. The Reverb 4000 single-engine, stereo, reverb processor has been designed to complement any large scale mixing consoles and have the intricacies required for professional studio work, whilst maintaining an intuitive and instantaneous front panel work flow for live applications. The 134 factory loaded presets, many derived from the TC Electronic Reverb 6000 and M5000 give the user instant effect access, and internal space for 100 user presets gives the user space to store their own customised presets based on any of the seven reverb algorithms available (NonLin2, VSS3, Ambiator, Reverb-4, VSS4, VSS4-TS, and DVR2). Up to 100 additional user presets can be stored on an inserted PCMCIA card and unlimited external user locations can be used if connected via USB to an external PC or Mac running TC Icon editor software. The front panel has a 56 x 128 dot graphic LCD that shows the preset selection and pre-delay, decay, and hi-decay settings. One main rotary control wheel allows the user to adjust parameter values in the control section while up/down cursor buttons give access to control section menus and navigation. A third button is used to confirm operations such as recall. Three independent rotary control wheels give direct access to pre-delay, decay, and hi-decay - 'great' for 'on-the-fly' editing. A 7-stage input level meter (-40dB to 0dB), overload, sample rate (44.1kHz, 48kHz, 88.2kHz, 96kHz), MIDI in, and digital in LED indicators are located to the left of the screen. A final LED labelled 'Edited' is illuminated when a recalled preset has been edited but not yet stored. A power button is located in the top left of the front. 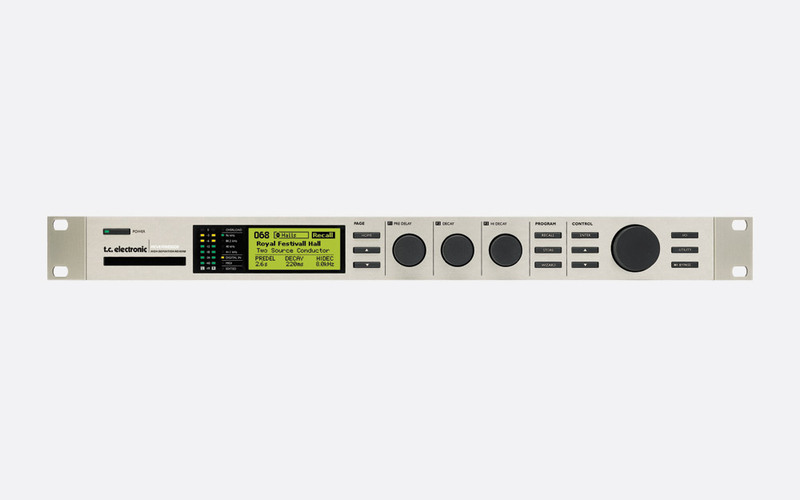 The Reverb 4000 can be purchased as a stand-alone product, or as a package including the TC Icon MKII remote. Analogue inputs: 2x balanced 3-pin XLR, 20k ohms. Analogue outputs: 2x balanced 3-pin XLR, 100 ohms. Digital inputs and outputs: 3-pin XLR, AES/EBU; RCA phono, S/PDIF; Optical, Tos-link/ADAT. Sample rates: 32kHz, 44.1kHz, 48kHz, 88.2kHz, 96kHz. MIDI: In, out, thru. Dimensions (WxHxD): 483 x 44 x 208mm. Weight: 2.35kg. 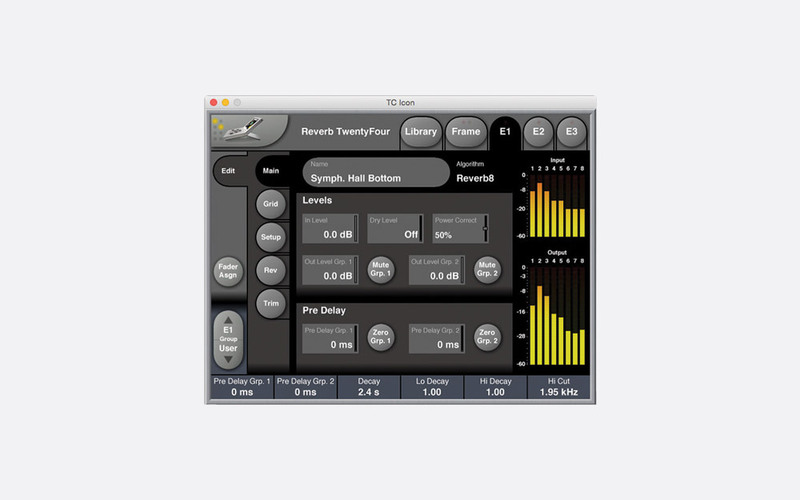 Reverb Twentyfour is a 24-channel reverb processer with three reverb engines that is powered by the popular Reverb 8 algorithm and System 6000 technology. Each of the 24 channels within the 1U rackmountable effects unit is independent therefore suited to processing audio for formats including Dolby Atmos, Barco Auro or the Japanese NHK multi-channel from 11.1 to 62.2 using additionally networked Reverb Twentyfours if required. The Reverb Twentyfour is compatible with input signals including mono, stereo, 5.1 and 7.1 via the MADI I/O interface. Compatible with the TC Icon remote via RJ45 Ethernet connection. A ‘Power Correction’ feature, that can be activated and defined, allows the addition of a D/R (direct to reverberant) ratio safeguard meaning the balance between the audio signal and the reverb applied maintains the defined level of reverb loudness. This can be pre-defined to one of three stages; OFF, 50%, or 100%. TC Electronic’s newly designed ‘envelopment technique’ gives the user the ability to add more reverb to a signal that already has spatial information, and the unit is downmix compatible to enable to 22, 11, 7, 5, 2, or 1 channel without introducing phasing or altering the mix. The front facing panel of the unit features only indication LEDs for power on, sync, bypass, ‘running’ to indicate the unit’s status, and ‘net’ which indicates when the Reverb Twentyfour is connected to a TC Icon remote, or network computer running TC Icon software. The ‘running’ LED illuminates green or red depending on status, whilst the ‘net’ LED illuminates green, yellow, or red. The sync LED illuminates grey, green, yellow, or red dependant upon synchronisation to a signal source. The rear facing panel houses all I/O connections including 1x 75Ohm BNC in and 1x 75Ohm BNC out for MADI, 2x RJ45 Ethernet connections for networking and optional Icon Remote, 1x 15-pin D-Sub connector for GPI and GPO, and a mains IEC power inlet.